Pro Disc is the best selection of new and forthcoming tracks together on one CD. Featuring smashes such as ‘Scream And Shout’ from will.i.am and Britney Spears, ‘I Knew You Were Trouble’ from Taylor Swift and the dance hit ‘Just One More Time’ from David Guetta. The disc also includes new releases from Olly Murs, Rihanna, Girls Aloud, JLS and Jake Bugg. 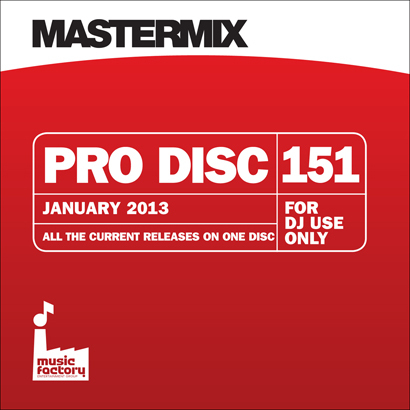 Pro Disc 151 is now available from Mastermix priced at £15.32.